OK, so this is not so much a ‘recipe’ as it is just something I’m totally obsessed with right now. Ha! As many of you know, I got an air fryer around Christmas this past year and I’m pretty obsessed with it. You can see my first post talking about the two kinds Elsie and I both have. Lately I’ve been really into making tofu in my air fryer because it’s seriously the BEST. First off, whether you are a meat eater, mostly plant-based, 100% vegan, whatever—I love tofu and think you should too. I certainly don’t think you should eat it exclusively, as there are lots of great protein sources in the world. 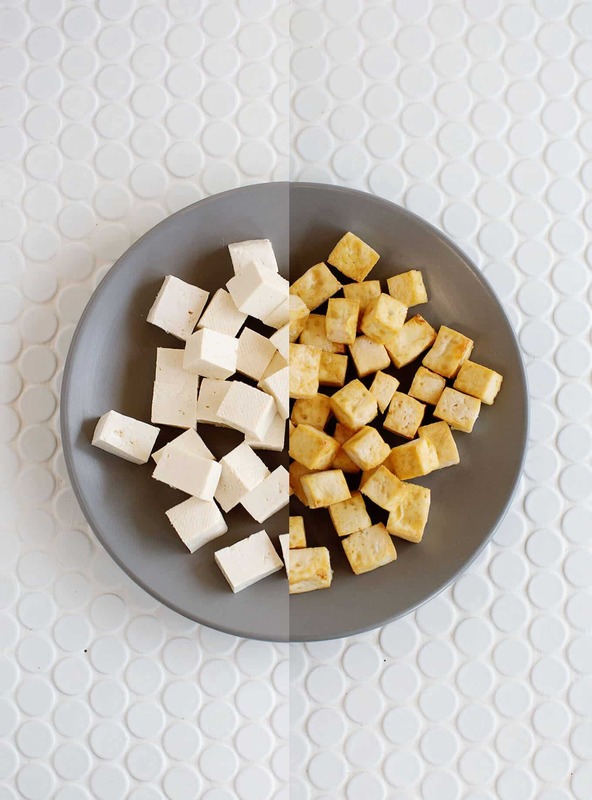 But tofu, and soy in general, is pretty awesome and you can read an article Lindsey (one of the dietitians we work with) wrote here called: Is Soy Safe? I shared this guide on how to build the perfect stir fry. Tofu is one of my favorite proteins to use. You should give it a try, it might become one of your favorites too. I love a good curry! And I have to admit that probably 9 out of 10 times when I make curry at home I add tofu. 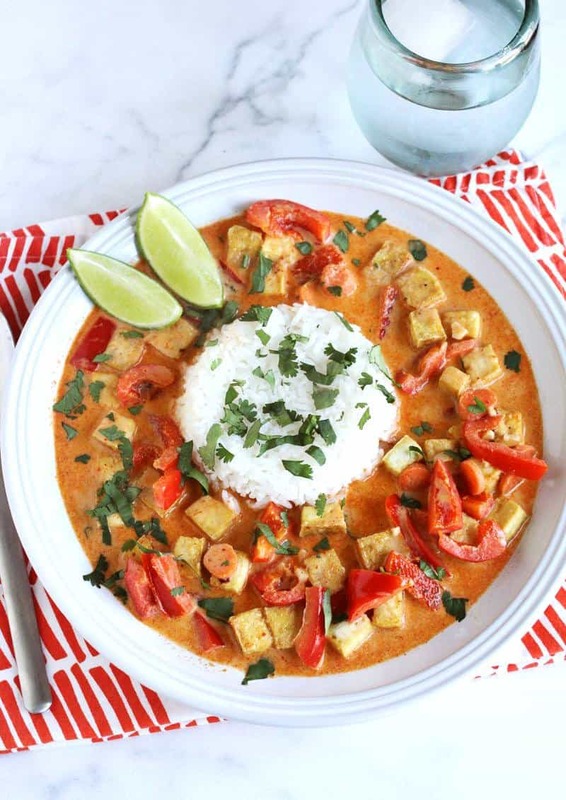 I love all curries and have shared a few recipes over the years including: red curry, simple yellow curry, easy green curry, and vegetarian Massaman curry. Yum! 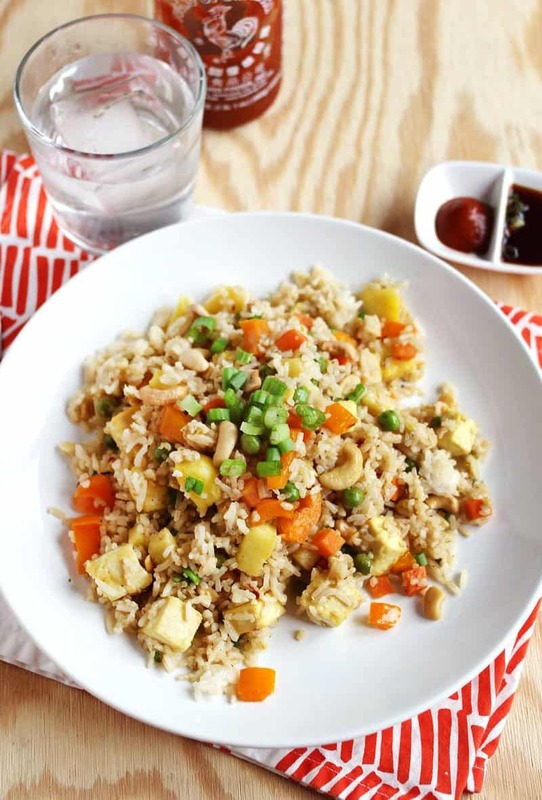 Easy and quick fried rice dishes are one of my go-to weeknight dinners. This easy pineapple fried rice is probably the recipe on this blog that I have made the most over the years. I love it! 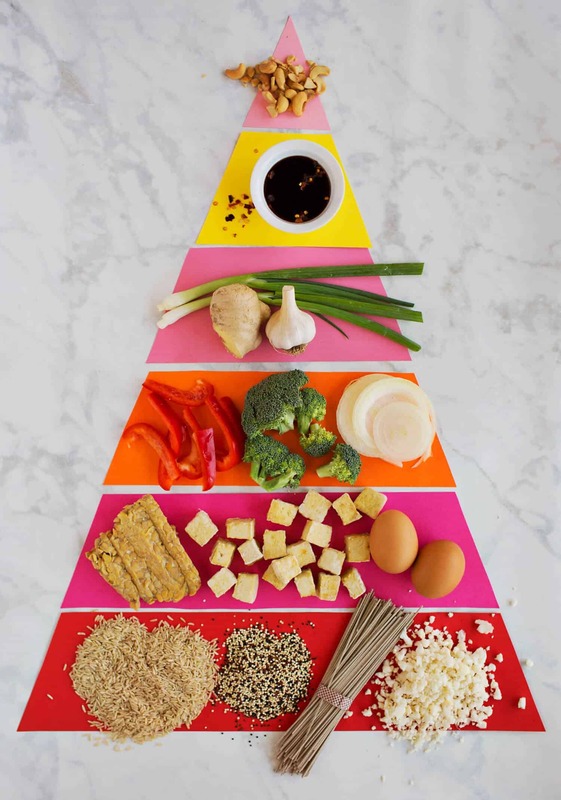 Lately I have been swapping out the rice for cauliflower rice and I LOVE it for a super filling but plant-filled meal, and I also add tofu for protein. 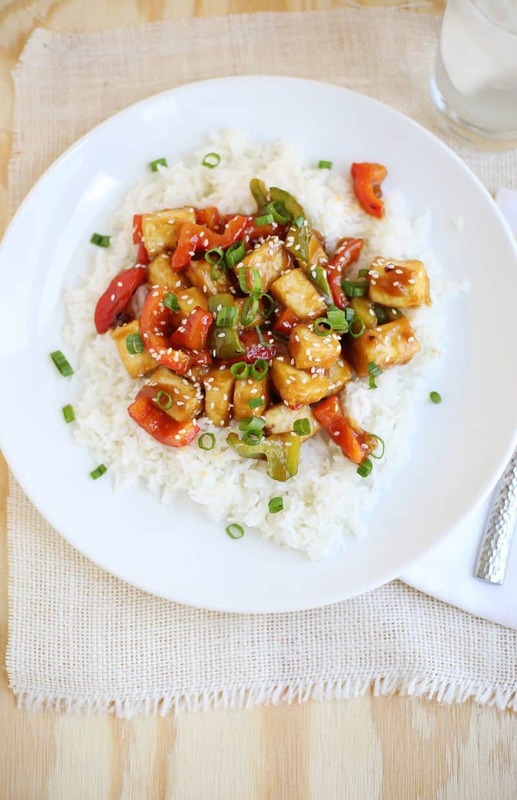 Another easy option is to experiment with different sauces and then just sauce up that tofu and serve over steamed rice, fried rice, or lightly cooked cauliflower rice. Easy! If you’re not into experimenting and you just want a sauce recipe, I get it—try this Honey and Miso Stir Fry or this Cashew Cauliflower (you can make just the sauce to top tofu or try the whole dish). And if that doesn’t convince you, just wait until you see how easy this tofu is to fry. I like to use extra firm tofu. Drain by pressing between two plates and either paper towels or clean kitchen towels to soak up excess moisture. Here you can see how I do it. I haven’t found the perfect technique to prepare tofu yet, maybe this one is the key! Thanks for the tip! My family eats tofu a lot (we’re Asian, after all!) 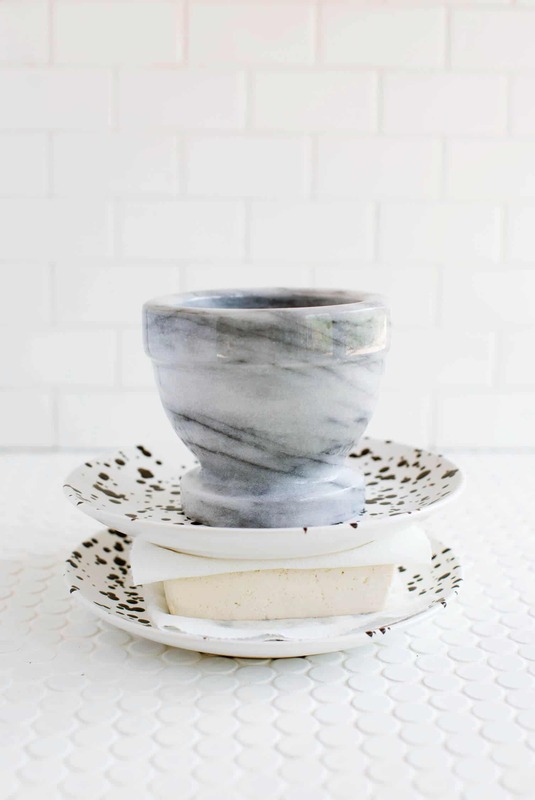 and this would be a perfect new way to serve it up! Too bad I don’t have an air-fryer 🙁 I’ve wanted one for sooo long but it’s too bulky for our tiny apartment! This is such a good idea! Tofu can be so tricky to cook with, I’ve only tried making a fried veggie dish in the air-fryer and it was so good. Adding this to the list! This looks really tasty actually. I do like tofu but I never cook it myself. That fryer looks great too! This looks so good! I totally need to try this! This looks delicious. I am not a big fan of certain tofu food, but I will try anything. Never cook it before either. Thanks for sharing . This is random but Emma- can you please get an Instant Pot?! I got one for Christmas and would love to get more recipe ideas for vegetarian/vegan and healthy(ish) things to cook in it! I gave up on trying to make tofu myself after one attempt years ago but this makes me want to try again. I never would have thought to use my air fryer! 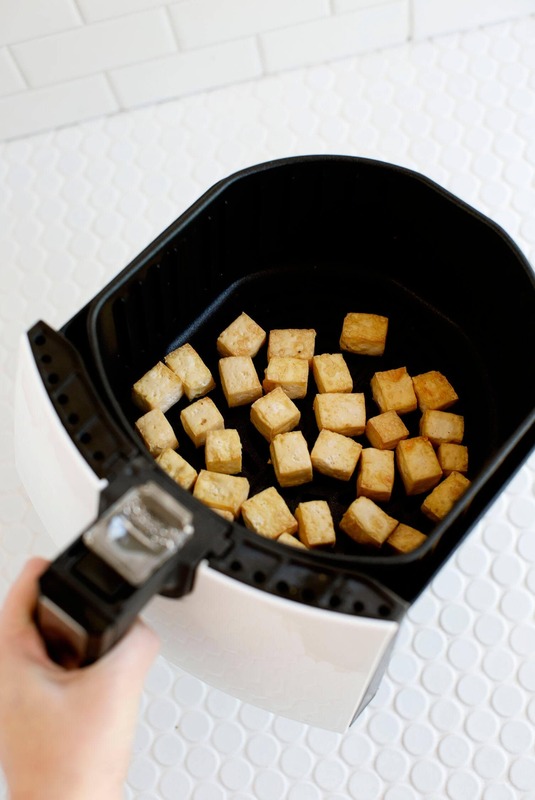 i love cooking tofu in my air fryer! it’s the only way i ever want to cook it now. it gets perfectly crispy.